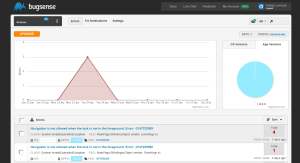 Last October, I blogged about how to use BugSense to track bugs into your mobile applications. Today, the startup of San Francisco announced a new pricing for their service. You can start for free, to $299 a month. As a reminder, with a very small package installed in your application, you can track any unhandled exception (when your application crash) or any other error you want to analyze. They updated the dashboard, the place where you can track any problem reported by your customers. This dashboard is evolving very often to give you a better user experience. Here is a screenshot of the dashboard for one of my applications for Windows Phone 7. About the pricing, for all the developers of small applications, with not many thousands of users, you can use this service for free! The major limitations are 500 errors a month and only one viewer. But if your business is growing up, you can still upgrade your plan to $19 a month to be allowed to send up to 25.000 errors a month. Have a look at the prices on BugSense for more details. All the plans allows you to create as many applications you want, even with the free plan! If you are an open source application developer, do not hesitate to contact them, they can offer you a Premium plan for free! Since the last time I blogged about it, they introduced the support of XNA on Windows Phone 7. It means, you can now, track problems in your games! To use it, it’s still very convenient, you can use NuGet to get the packages and install it into your application / game. My opinion about these price is that the limit of 500 errors a month of the free plan can be reached very fast if your popularity on the marketplace grows. But the price of the next plan, $20 a month, could be a bit expensive. Maybe an intermediate plan, with “only” up to 5,000 errors would be a good alternative. But don’t forget that you can monetize your application with Microsoft Advertising (not available in every countries). I’m using BugSense in my applications for Windows Phone 7 to track all bugs. The biggest part of the problems come from the applications Earthquakes because the number of downloads is pretty high (thank you for that), but it’s usually only minor issues, and thanks to BugSense I can catch them very quickly, with the email sent to alert you when you receive a new unknown crash. So I can very quickly fix the problems, now the slowest part is the certification on the Microsoft Marketplace, that takes almost a week to validate an update. Please Microsoft improve the certification process!!! Follow @bugsense on Twitter. Then have a look at their website.